1. For men this means if you own a tuxedo, please wear it. If you don’t own a tuxedo, wear a black or dark navy suit, with a white shirt and formal tie. Black, polished leather shoes and cufflinks will complete the look. 2. For women, wear a long, short or on-trend hi/low dress; they are all good options. It’s the time to wear your blingiest cocktail jewelry. Take care on choosing shoes as you want them comfortable for dancing but dressy enough to balance out the dress. These ankle-strap, block heel sandals seem to work well. 3. Black Tie Optional is one step down from Black Tie, but similar. Most men will wear dark suits, with a white shirt and tie. Women have more options, and can wear a gown, a cocktail dress, dressy pants, or even a jumpsuit. 4. Complete your outfit with shiny accessories like gold cufflinks, a clutch or sparkly jewelry. A clutch bag with a simple and clean look like the one below from Nordstrom will complement your statement dress and tie the entire outfit together. 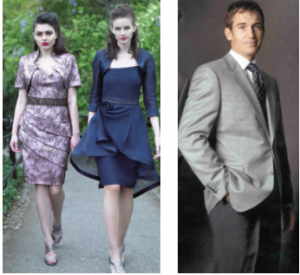 5.Cocktail attire gives everyone more leeway, and can include pants for women, various dress styles including the new maxi-style dresses, along with a sport jackets for men. A tie is suggested but not essential. 6. Cocktail Attire is, as it sounds, a good excuse to get dressed up.Even if you opt for one of the more casual options, plan on looking festive, either with shiny accessories, extra jewelry, or details that say fun. 7.Casual Attire is a catchall phrase along with smart casual, dressy casual, and dress to impress. Casual can include festive dresses; sundresses; pants, capris or palazzo pants; for men, nice slacks or khakis, and sport jackets with or without a tie. Make sure you are wearing something fun, whether it’s a pair of glittering drop earrings, or lace-up platform sandals. You don’t want to look boring! 8. Go on-trend with an off the shoulder or open-shoulder dress that can be easily paired with a nice wedge shoe or strappy sandal. This way you’ll look put together but not too formal. Another look to consider for women if you are not into dresses is separates. This can include a pantsuit with a blouse, a playful two-piece set, or a skirt and top combo.